On the second episode of Mnet variety show “Dirty Talk” aired on March 27, the panelists discussed the subject of whether BIG BANG’s G-Dragon or Block B’s Zico is the better rapper. 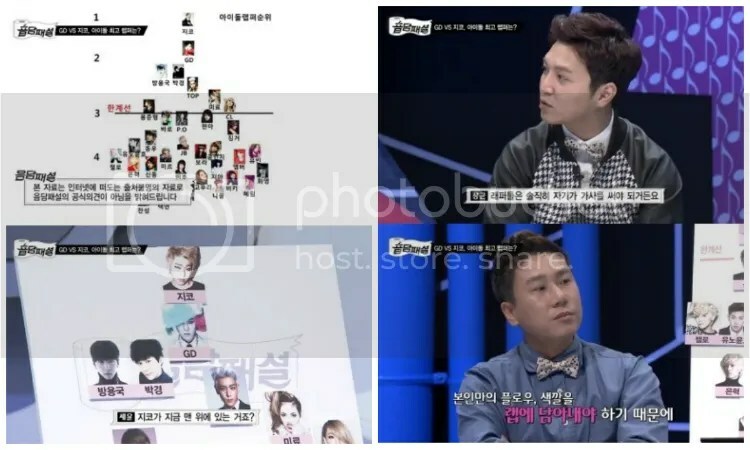 In order to properly compare the two, the show had prepared a chart of idol rapper rankings currently making its rounds on an online community forum. According to the chart, Zico ranks at number one, with G-Dragon in second place, and B.A.P’s Bang Yong Guk and Block B’s Kyung tied for third. They are followed by BIGBANG’s T.O.P and Brown Eyed Girls‘ Miryo, while BEAST‘s Yong Jun Hyung and 2NE1‘s CL are notable mentions. “Dirty Talk” is a program that allows viewers to leave burning and bizarre questions on its message board. MCs Kim Gura, Yoo Se Yoon, Lee Sang Min, producer Duble Sidekick (Jang Geun), music critic Im Jin Pyo and a one-day MC discuss interesting topics and try to satisfy the curiosity of viewers.